Pneu-Hyd Industries is a North American manufacturer and designer of custom hydraulic cylinders including but not limited to single acting, double acting, displacement, large bore, telescopic and piggyback. Pneu-Hyd is an ISO 9001 certified, lean manufacturing company offering superior quality and short lead times. We are built to design, develop and manufacture custom Hydraulic Cylinders. With experience dating back to 1973 we excel at building and establishing long term business relationships that offer optimal products and services. We understand the challenges you face regarding accuracy, complexity and timeliness; and offer a manufacturing service that excels in quality and delivery. Pneu-Hyd has retained its history while also being able to adapt and change with today’s market. Long term business relationships are of upmost importance to us at Pneu-Hyd. With our roots planted as a family run business, we have made many decisions along the way to keep that culture alive. We personally visit our customers and encourage all customers to visit our location to ensure open lines of communication and honesty. We take the time to learn about your business and your individual needs so we can provide better service to you. We pride ourselves on maintaining long term business relationships and understand that it takes time to build trust in new ones. Pneu-Hyd Industries is ISO 9001 Certified for Design and Manufacturing of Hydraulic Cylinders. This certification encompassed with Lean Manufacturing allows us to ensure our products are safe, reliable and of superior quality. Our facility upholds strict cleanliness guidelines at all times. Through a 5S system we maintain a clean and organized environment. This allows us to guarantee your cylinders are produced promptly and efficiently. Using Solidworks software and innovative materials we custom design cylinders that fit your application. We have continually made improvements to our manufacturing process over our 40+ years. We’ve implemented lean manufacturing and moved to a larger facility. These changes have enabled us to support growth and streamlined our supply chain process in order to respond quickly to market changes. All with the goal to decrease lead time and improve quality. 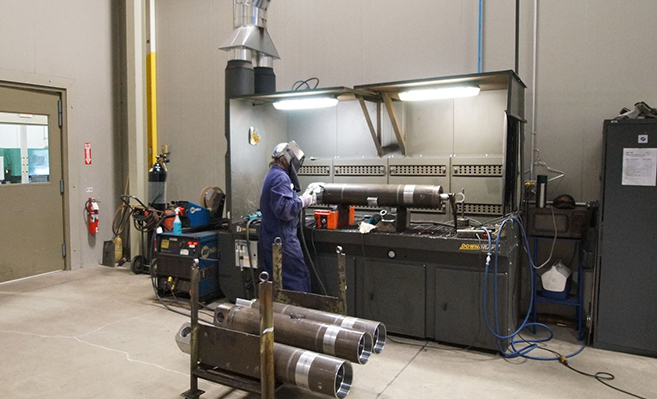 We offer a 4 week lead time on new custom cylinders and maintain as little as 2 week lead time on existing designs. A consistent unbroken supply chain allows us to produce cylinders at a steady pace. We understand how important production scheduling and inventory flow are to your business. We will work with you on an individual basis and will process blanket orders to assist with your inventory levels. All of our materials are sourced in North America and Europe to adhere to our best quality standard.